Being bundled up is one of my favorite feelings ever. 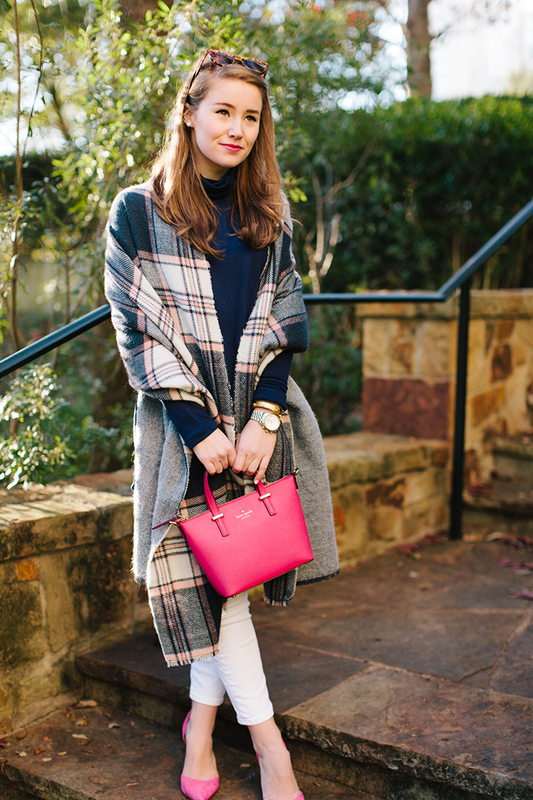 Luckily for me, I’ve always found something instantly elegant and timeless in the look of an oversized wrap! A definite change-up from coats and sweaters, and a refreshing way to brave the cold weather all in one. Not only is this navy and pale pink number perfectly chic in it’s color pallet and oversized proportions, it is just about the softest thing I’ve ever touched! What I wouldn’t give for you to be able to feel it through the photos. Truth be told… I’ve used it as a blanket since it is so cozy and absolutely huge. 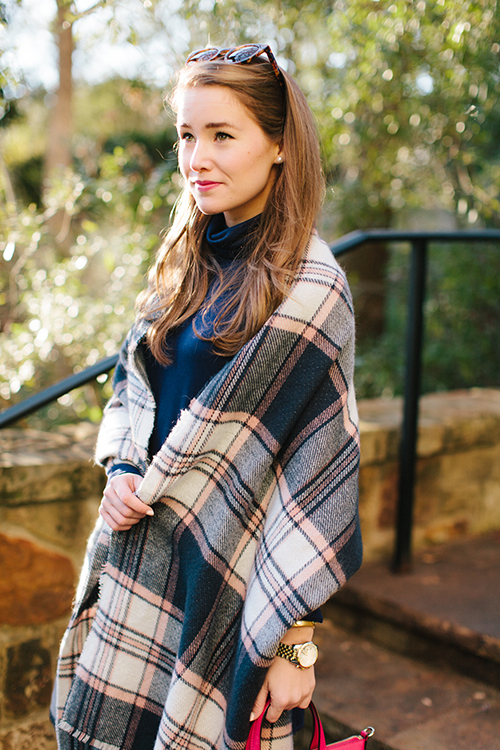 (The ultimate extreme blanket scarf right here, y’all.) And while I couldn’t love the blue and pink color combination more, it’s reversible to grey so you can achieve more of a neutral look as well! I hope everyone has been having a great week so far. I’m a little too excited, because after being cooped up in bed all week with a cold, my friend CA and I are headed to the first showing of the new Nicholas Sparks movie, The Choice, tonight! Believe it or not, I am the least. harsh. movie critic of all time. Give me a cute couple in love, and I’m sold. Needless to say, I can already tell you I’m gonna love it! Ooh I love that plaid wrap! It looks amazing with the navy turtleneck. So cute! 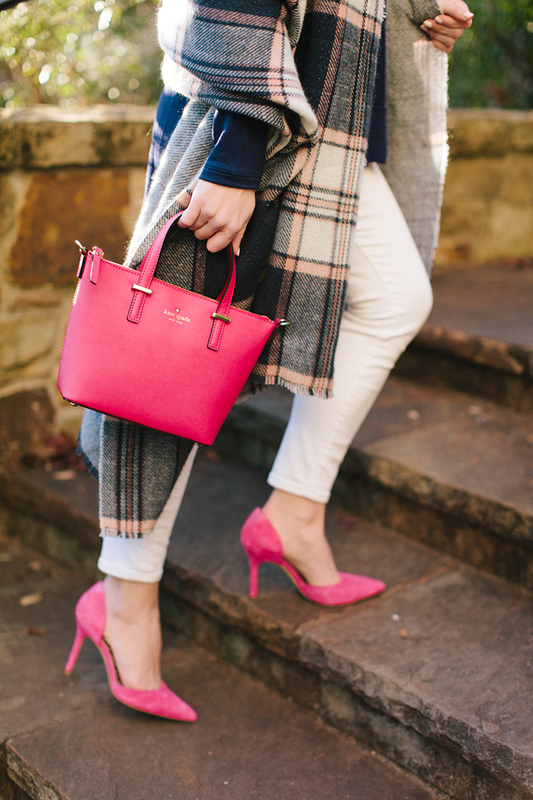 Love that pink Kate Spade purse! Pink purses are my favorite, such a fun way to add a pop of color! 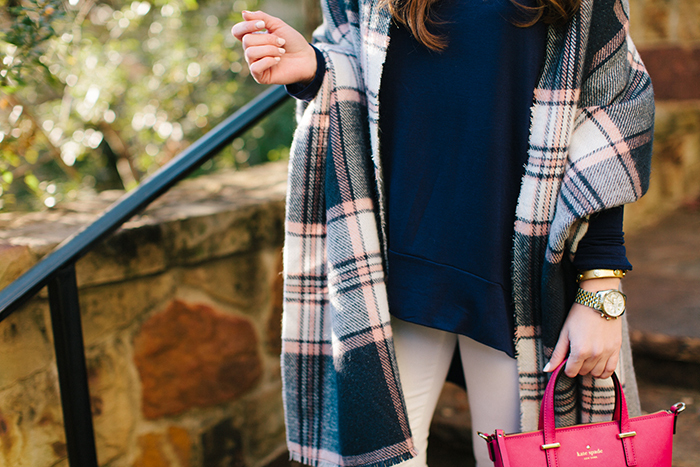 Pretty plaid!! What a classic. I love the splashes of pink against the navy. 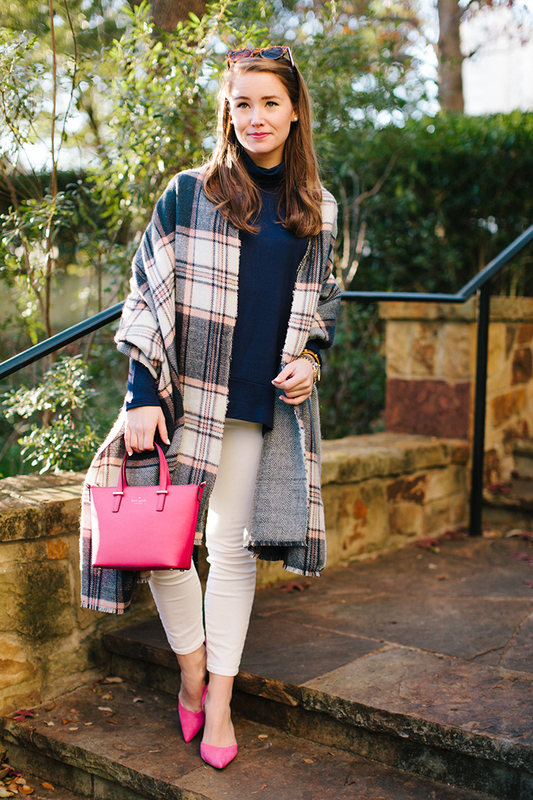 This is a great way to incorporate color into your winter wardrobe. Have fun at the movies, I’m a sucker for most of those Nicholas Sparks movies too haha! Love the pink heels in this too! 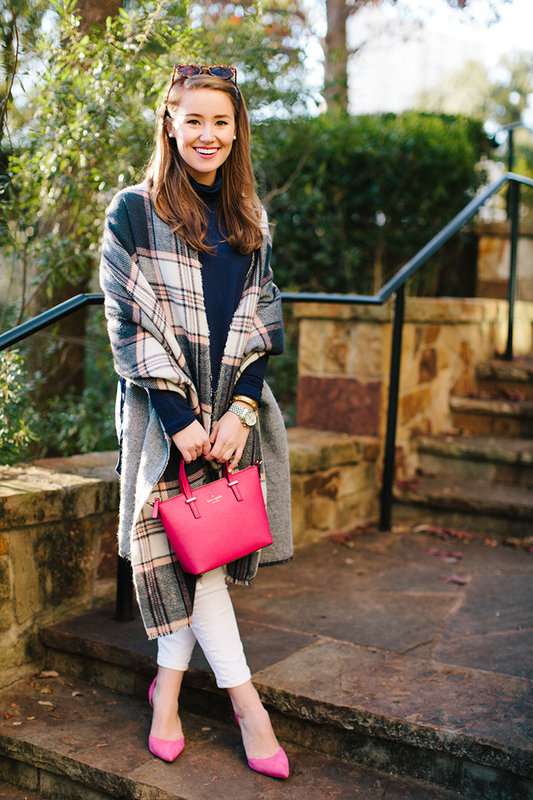 That scarf needs to be in my closet PRONTO! Too cute!! You are so cute! 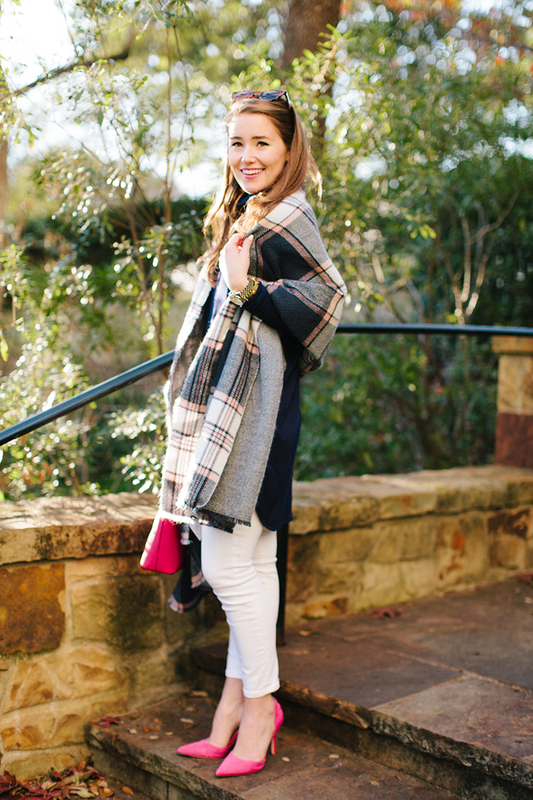 I love the plaid scarf! I love how you accessorized with pink! So pretty!